Ductile Iron is a family of cast graphitic irons which possess high strength, ductility and resistance to shock. Annealed cast ductile iron can be bent twisted or deformed without fracturing. Its strength, toughness and ductility duplicate many frades of steel and far exceed those of standard fray irons. Yet it possesses the advantages of design flexibility and low cost casting procedure similar to gray iron. 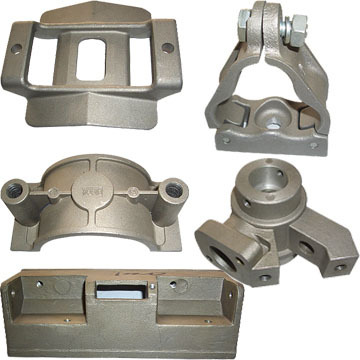 Normally ductile Iron Casting is made by sand casting process. However, some ductile iron castings need to be done by Lost Wax Casting process. Those ductile iron investment casting are produced normally by sodium silicate lost wax casting process. One area of potential confusion is the number of ways ductile iron is described. All of the following are used and are interchangeable - Ductile Iron, Ductile Cast Iron, SG, SG Iron, Spheroidal Graphite and Spheroidal Graphite Cast Iron. ASTM A536 Standard: 60-40-18; 65-45-12 ect. Taiyuan Simis Precision Casting Casting Co., Ltd. Is able to cast any ductile iron investment casting parts according to your requirements.